Be prepared. Recover quickly when disaster strikes. Call 210-491-0009 to plan your backup strategy. Fill out form to choose a webinar for your free Meraki Access Point. We’ll identify IT issues much faster – often before you experience problems, and address them proactively. Lengthen the life span of your assets and minimize technology problems that reduce productivity. You get the right technology expert on the job from the start with fast, reliable resolution. Deciding on outsourced IT service or in-house tech staff is often a hard decision for many small businesses to make. The biggest driving factor is cost savings. Some see estimated savings up to 25 to 40 percent. Unfortunately, technology costs can quickly add up if not properly managed. Keeping an up-to-date inventory of hardware and software is the first step in making sure organizations are not buying duplicate pieces of technology. 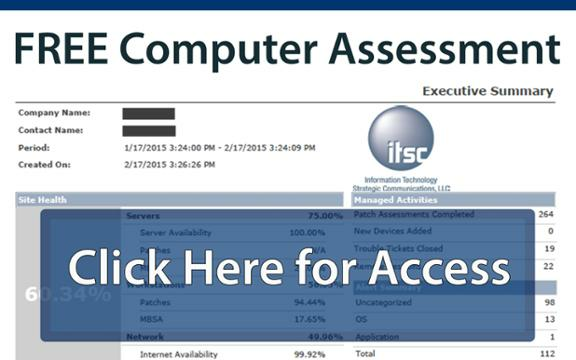 ITSC will compile comprehensive asset reports to help organize the network. Many people use these reports for insurance, business valuations, and asset management. Duplicate hardware and software is not the only thing costing businesses money. The lack of time and expertise probably causes the most expense. Businesses in industries like healthcare, nonprofits and retail are so busy serving their patients, clients or customers that by the end of the day, they are too busy to accurately manage their IT networks. Keep it simple. Contact us today to make ITSC your outsourced IT service provider. San Antonio, North, Central, South Central Texas, Dallas, Austin, San Marcos, New Braunfels, Seguin, and surrounding areas. Now in Colorado! Expect loyal, cost-effective, confidential managed service. Complete possession of firm professional best-practices standards. Connecting a collaborative environment through communication. We are a part of your IT management team. We are responsible for reliable technology management solutions.